Alabama? Absolutely! 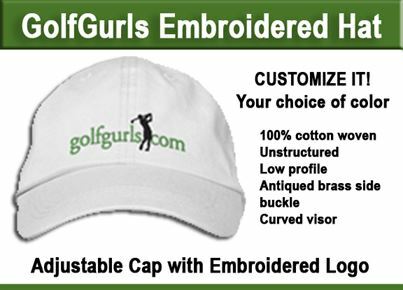 for Amazing Golf – Plus! 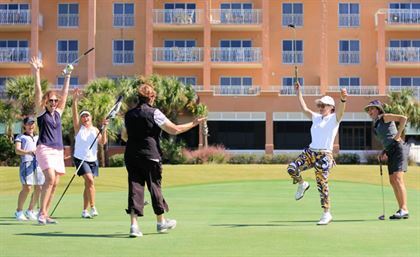 Looking for a spectacular golf vacation that will challenge both your game and your senses? Look no further than Alabama Gulf Shores! Just returned from a fabulous fun media tour that featured some of the best golf and gulf coast cuisine available in Alabama. I joined four writers who came from vastly different regions of the country but with one major goal: to experience great golf and amazing Alabama hospitality. We only had four days to get it all in but our hosts, Pam Shaheen of Crossroad Marketing, Inc. and Kay Maghan of Gulf Shores & Orange Beach Tourism made sure we touched the high points including three fabulous golf courses, the spa at the Beach Club — and a whirlwind visit to some of the best restaurants in southern Alabama. Hold on to your golf clubs – here we go! It was late Tuesday afternoon when our group gathered at the airport terminal in Pensacola Florida. Within an hour we were over the Florida/Alabama border and heading for the first stop on our Progressive Culinary Tour. Have you ever been on a culinary tour? Have you ever been on an Alabama Culinary Tour? The hospitality, food and drinks are amazing. First Stop: The Gulf – A uniquely designed restaurant destination, serving locally inspired food and beverages in a beautiful waterfront setting. We stopped at the bar, ordered drinks and found our way to the couches on the beach. (You read that right!- Couches on the beach! Comfortable seating on a soft sandy beach – a fire pit nearby if the night air turned cool. ) I would have been happy to just sit back and close my eyes and sip the night away, but our second culinary stop on the tour was waiting. 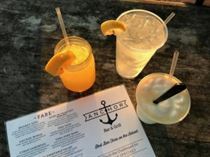 Second Stop: The Anchor Bar & Grill – Offers stunning views of Terry Cove / Famous for their Wagyu Burgers and Blonde Bushwacker Cocktail – We ordered drinks and several appetizers including a basket of their special Tater Tots with pickled onions, tomato jam and jalepeno peppers. Very tasty. Easy to keep eating! I rewarded myself with a Blonde Bushwacker complete with the Vanilla Bean Infused Topper. Delicious! But trust me, if you want to stay awake for the rest of the evening, limit yourself to just one. It’s a mighty powerful drink!!! Third Stop on our Culinary Tour: Entrées at Big Fish. Big Fish is listed as one of the best seafood restaurants in the area, with a 4.5 star rating from tripadvisor.com Everything on the menu is delicious. Don’t be deceived by its strip mall location. This is an upscale restaurant with a sophisticated yet comfortable atmosphere. 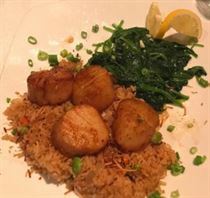 I sampled several dishes: the Tuna Sashimi TarTar was excellent, and the Pan Seared Sea Scallops were delicious. I hesitated trying the Flash Fried Lobster Tail. (I am, after all, from New England – and arrogant enough to think nowhere else can match New England lobster! But I was wrong!) The Lobster Tail was well prepared and I really enjoyed it. It was getting late but we had one more stop to make: Fourth Stop on our tour: Dessert at Fishers. – Re-creating mouthwatering cuisine… featured in “Southern Living” – (Owner Bill Briand.) Our group gathered in the upstairs restaurant and that’s when the show began. Famous for their desserts and seasonal ice cream and sorbets, no sooner had we been seated then a parade of waitresses and waiters came out from the kitchen, each carrying trays full of sweet concoctions. Within moments the large table was full of peaches and cream, strawberry lemonade ice box pie, caramel popcorn sundaes and sweet potato sorbet —a nod to the current season of autumn. The pastry chef joined us at the table to point out the different flavors of sorbet which were quickly sampled. It was now night and time to head to “Barefoot” – our beach house in Fort Morgan and homebase for the next three days. I could hear the sound of crashing waves so I knew the beach was not far away, but it wasn’t until morning that I discovered how close to the shore we really were. “Barefoot” is designed as a special event house — perfect for a golf league vacation, family event, a conference or any other large gathering. Private rooms en suite, large kitchen, living area and deck with a sunken swimming pool! 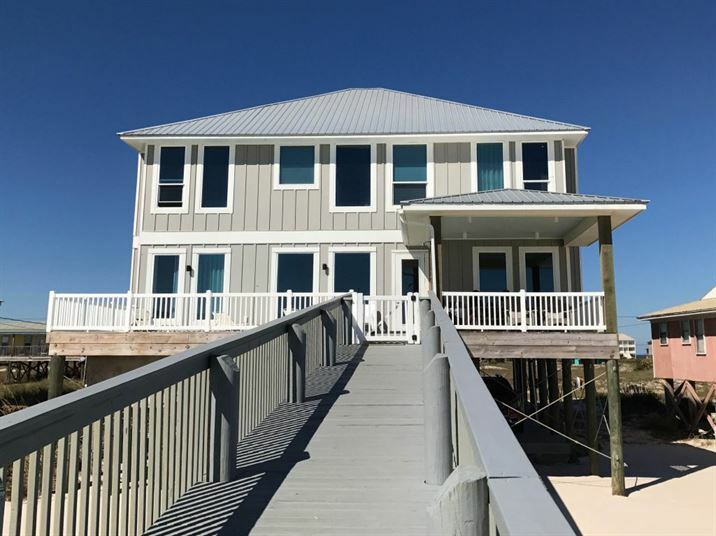 For more information about this and other available vacation rentals contact Harris Properties. Peninsula Golf & Racquet Club. 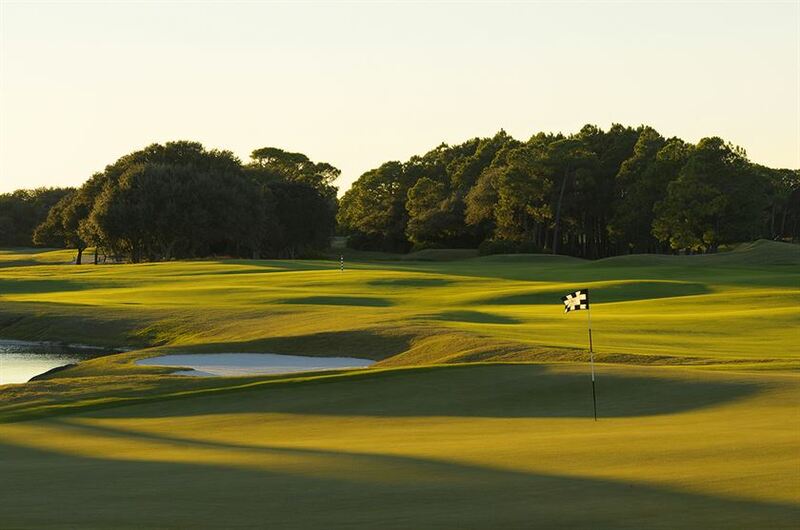 Rated 4 ½ stars by “Golf Digest” and selected as one of the “most memorable and enjoyable” courses in the southeast, Peninsula provides a golfing experience that is rivaled by few. 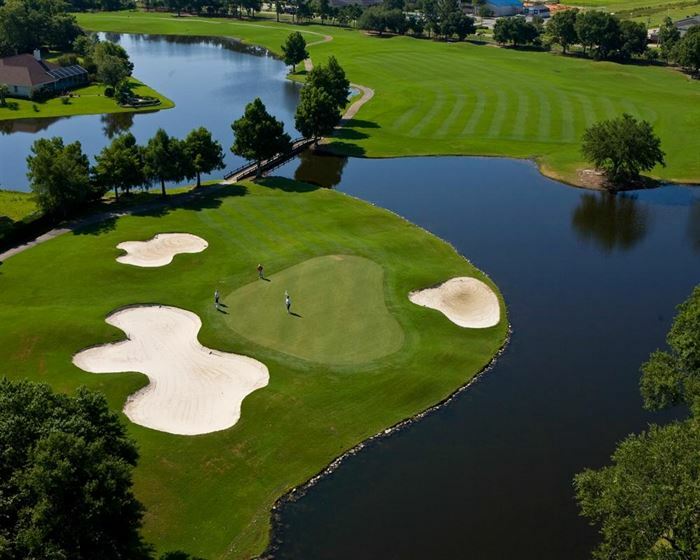 Designed by the renowned southern favorite, Earl Stone, the 27-hole golf course boasts 7,026 yards from the championship tees and delivers a playable and enjoyable layout for golfers of all skill levels. Joined by a couple of local golfers, our group of writers split into two groups of four. With four different tees the course is designed to be enjoyable for all skill levels. Our foursome decided to play the course as a round of “Best Ball.” That way we were able to play two of the three nine hole courses at Peninsula and be back at the club house in plenty of time for afternoon events. Wide fairways and fast undulating greens made for a challenging experience. I trapped myself in a couple of bunkers but the sand was remarkably light and fluffy and easy to escape. Surrounded by lush grasses and water, wildlife was abundant. We spotted blue herons and even a bald headed eagle flying high overhead. 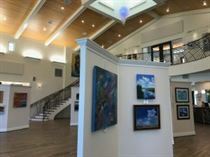 Next stop: The Coastal Art Center Popular as an “oasis” for the arts, this newly constructed center is a beautifully designed gallery for the work of local artists as well as a vibrant educational setting for students interested in glass blowing and pottery. Located along the shore of Wolf Bay, the center has become a popular venue for weddings and receptions. Final stop: Dining at Lulu’s Gulf Shores! What can I say?! 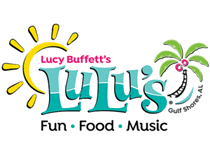 If you are looking for authentic Alabama cuisine mixed in with a lot of fun and a crazy time – check out Lucy Buffet’s restaurant on the Intercoastal Waterway at Gulf Shores. 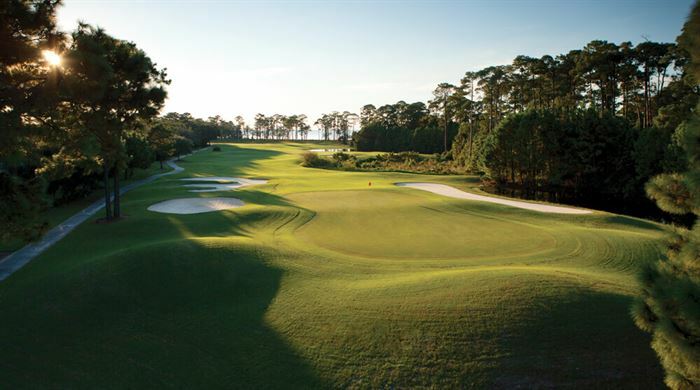 Kiva Dunes is the number one golf course in Alabama, and is consistently ranked as one of the top courses in the country. This is a “must play” course for your bucket list! With Bon Secour Bay on one side of the course and the Gulf on the other, the wind can be a major factor. We were lucky to play on a relatively calm day and the sun brightly shone down on our foursome as we played a round. 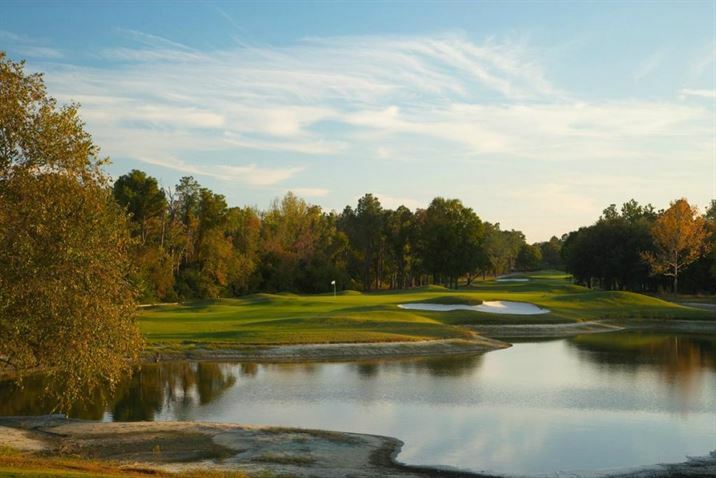 The course is designed with wide fairways and the choice of four tees. Champion golfers and those of us who play from the forward marks can both find the course a truly enjoyable experience. Even getting into trouble was fun as the silky “sugar sand” made it easy to get out of bunkers (most of the time!) This golf course was a top shelf experience for me. After being spoiled for three days of total indulgence, I just had to give in and get a massage to soothe my aching muscles. Golf can be hard work you know! I chose a Swedish Massage with “CJ” and thoroughly enjoyed the quiet music and fragrant oils as he helped restore my inner balance! The food and service were both excellent. I particularly enjoyed the Oysters Rockefeller. I thought that was pretty adventurous but why not stretch myself a bit more? 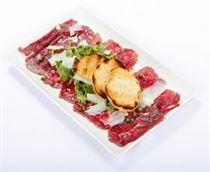 I discovered the Ostrich Carpaccio! 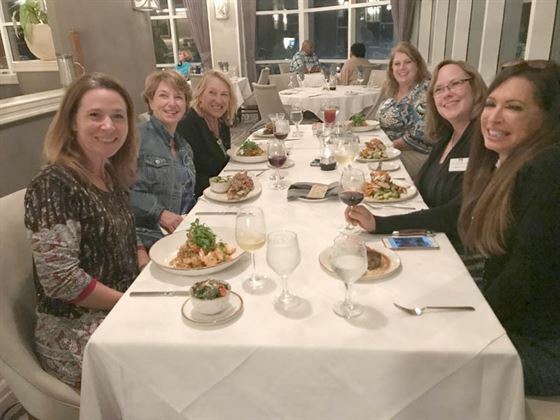 The menu is filled with tantalizing options for every palette and our table of writers enjoyed each and every dish from the innovative menu of award winning chef Brody Olive. Golf at Cotton Creek at Craft Farms Our last day at Gulf Shores and Orange Beach we played this wonderful course designed by the great golf legend, Arnold Palmer. Craft Farms with it’s rolling fairways, numerous lakes and ponds and fast greens was a challenge. But there were both risks and rewards for each of us who played the course. There are a lot of challenging shots over water, but if you reached the green, the generous design of the course helped funnel the ball into a good position. What a great trip. We played some great golf courses, enjoyed wonderful food and experienced the very warm hospitality from the people of Alabama! 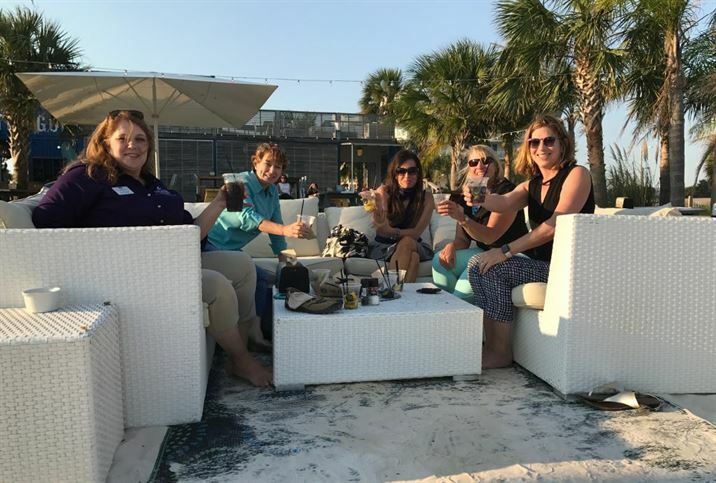 Although the focus of our tour was on discovering the best venues for women golfers, every spot we visited would be a great choice for any group. I have to repeat what I wrote at the beginning of this article: If you are looking for a spectacular golf vacation that will challenge both your game and your senses? Look no further than Alabama Gulf Shores! 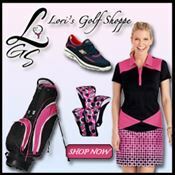 Is The PGA Merchandise Show in Orlando Worth The Trip? Sounds like a fabulous trip and a wonderful part of the country for great golf, food and fun. I’ll have to get myself there. You would love it. Very family friendly with lots of beaches.